This demo surveillance video demonstrates the surveillance capabilities of the HCPRO-420SC Hidden HD Fire Sprinkler Camera. 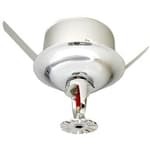 The HCPRO-420SC is a hidden fire sprinkler security camera with HD resolution. We recently installed this one in the sales room at CCTV Camera Pros office. This video was captured with the camera set to 1080p HD-TVI video mode and it is hard wired to an iDVR-PRO surveillance DVR using RG59 coax cable. The 3.7mm pinhole lens does a good job of capturing an overview of this room which is 15 feet wide. Although not demonstrated in this video, this hidden sprinkler cam also has a built-in audio surveillance microphone. You can see the small pinhole for the mic labeled in blue. The white RCA port on the cable is connected to the audio output to a DVR. The yellow BNC connector connects to the video input of the DVR and the small joystick can be used to access to cameras on screen display menu and also switch video modes. To change the video mode of the camera, the joystick is held in these directions for 5 seconds to switch between AHD, HD-TVI, HDCVI, and analog CCTV video modes. For more information and the latest pricing, please visit www.cctvcamerapros.com/420sc. Thank you for watching. Click here to learn more about the HCPRO-420SC Hidden HD Fire Sprinkler Camera used in this video.